Turkish President Recep Tayyip Erdoğan said a Jarabulus-like operation could free the northern Iraqi city of Mosul from the Daesh terror group. 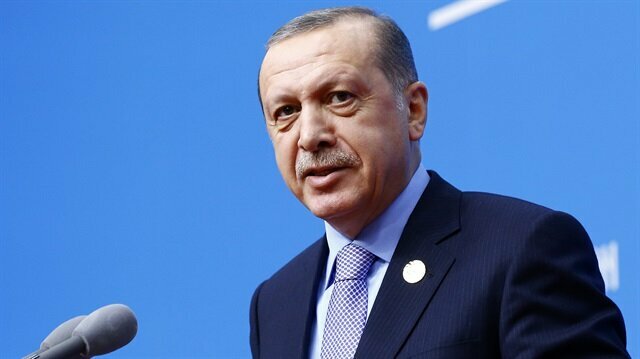 Citing the Turkish military-backed Free Syrian Army (FSA) operation in northern Syria, Erdoğan said that a similar operation could free the Iraqi city of Mosul. He said the military operation, Euphrates Shield, which began with the freeing of the town of Jarabulus from Daesh, was continuing with a southward thrust, with important advances toward al-Rai and Manbij. "With our military support to moderate opposition groups, significant progress has been made," said the president. Erdoğan said the opposition fighters currently fighting against Daesh were those who benefitted from Turkey's train-and-equip program. He added that a total of 1,400 moderate opposition fighters who were trained by Turkey are currently fighting in northern Syria. The support of Turkish artillery and the bombing campaign by the anti-DAESH coalition countries ensured the fighters succeeded in pushing back the terrorist group from border cities, freeing dozens of villages including the strategic city of Jarabulus. The next target of the Operation Euphrates Shield would be Daesh-held Al-Bab city, the president said adding the second target would be the Manbij city currently under control of PYD/PKK terrorists supported by the U.S. He reiterated that PYD/PKK should pull back to the east of the Euphrates River, evacuating Manbij as the U.S. agreed previously. Obama's gest to Erdoğan: the Raqqa proposal! The U.S. authority said the terror group had already evacuated the city, but Ankara and the local sources said PYD/PKK terrorists are still in Manbij. “If they leave the city, then we don't have any problem there,” Erdoğan said indicating that Turkey-backed FSA fighters could capture the city without a clash. Erdoğan said the U.S. had refused Turkey's initial proposal to free Manbij with trained Arab fighters, as the city was over 90 percent Arab. Despite this, the U.S. attempted to highlight PYD/PKK terrorists, but “we refused it and demanded them to evacuate the city,” Erdoğan noted. He added that Washington had rejected Ankara's proposals, accusing that it would cause a delay of two to three months. "With logistic support from the Turkish military, opposition fighters have made some headway toward al-Rai and now are moving eastward,” Erdoğan underlined the recent success in anti-Daesh fight. Six Syrian villages were liberated from Daesh by Free Syrian Army (FSA) fighters, the Turkish military said Wednesday.In a statement, the Turkish General Staff said the villages were cleared as part of Operation Euphrates Shield, which began two weeks ago as the FSA, backed by the Turkish Armed Forces, took the city of Jarabulus from Daesh.The villages are located around 12 kilometers (7 miles) to the southeast of the town of Al-Rai, known as Cobanbey in Turkish.Euphrates Shield has driven Daesh from Turkey's border with Syria as Turkish armor, artillery, special forces and jets support FSA fighters. “Daesh, which was forced to vacate Jarabulus, is on its way to al-Bab. Naturally, Daesh's most crucial headquarters is Raqqa. Obama especially wants to work together concerning Raqqa. We also indicated that there won't be any inconvenience from our aspect,” Erdoğan said. The areas freed from Daesh in northern Syria could be used for relocating Syrian refugees in Turkey, he said adding that refugee flows from the war-torn country stopped after the operation Euphrates Shield. "Since then, the people of northern Syria are more self-confident. The people who live in the region are culturally very close to us. This gives us the opportunity to build true accommodations, rather than camps in the region." 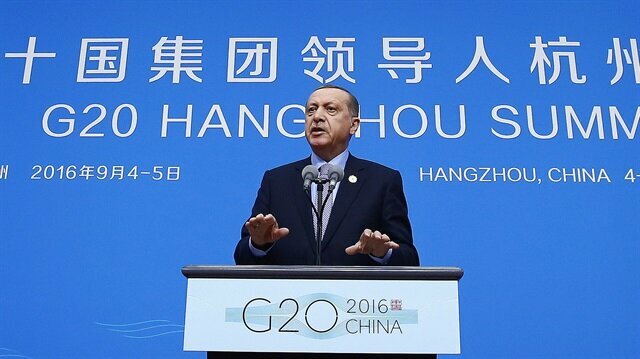 Turkish President Recep Tayyıp Erdoğan during the G-20 Summit, pointed out last year's diplomatic dialogue and criticized the Western countries for not taking any action when they suggested a safe zone could help solve the Syrian crisis. Erdoğan urged world powers to set up a "safe zone" in Syria, providing people in the Arab nation with an area that was free from fighting and which would help stem the flow of refugees.Speaking at a gathering of leaders of the G20 in China, Erdoğan said he had called specifically for a "no-fly zone" in talks with the Russian and U.S. leaders.“At the leaders' summit in Antalya, we said that the Syrian crisis could be solved by creating a safe zone for the refugees, and we reiterated this. Not a single country took a solid step; the Syrian subject continues to be a bleeding wound," Turkish President said.He added that the Western countries' being "bent on their security", to the point of taking on a "racist" attitude is unfortunately "shameful". "Right now, in Syria, 600,000 civilians lost their lives. To still say 'let Assad stay' seems to me like an embarrassment to humanity," Erdoğan emphasized.While commenting on Turkey's Operation Euphrates Shield, Erdoğan reiterated that the aim of Turkish operation is to stop terror groups advancing in northern Syria. "Turkish military's anti-terror operation in Syria aimed to drive Daesh away from its border and ensure the YPG terrorists did not expand in the area," the President said. Turkey says both Daesh and the YPG are terrorist organizations.He also highlighted that Turkey's operation in northern Syria does not threaten Syria's territorial integrity.The president said he was working with U.S.-led coalition forces and Russia to establish a ceasefire in Aleppo before the Eid al-Adha religious holiday, expected to start around Sept. 11. Erdoğan reiterated his idea of establishing a safe-zone across the border in northern Syria, underlining that world leaders had not done anything despite making a deal on the issue. "The same topic was raised during last year's G20 summit in Antalya, but I need to unfortunately note that nothing has been done since then." While describing his meeting with U.S. President Barack Obama and Russian President Vladimir Putin, Erdoğan said he raised the concern about the ongoing situation in Aleppo, proposing both leaders for an immediate ceasefire deal in the second largest city of the country. Syrian regime forces and allied militias have re-imposed their siege on opposition-held parts of the northern city of Aleppo, according to local opposition sources. Backed by Russian warplanes, regime forces captured several positions near southern Aleppo's Ramousa area on Sunday, cutting opposition supply lines into the city, opposition sources said, requesting anonymity due to fears for their safety. "The city is now under siege again," one of the sources told Anadolu Agency. Last month, opposition forces managed to break a crippling regime blockade on several districts of Aleppo. According to the same sources, clashes remain ongoing in the city as opposition fighters try to push regime troops back from their positions. In a related development, three civilians were killed Sunday when regime helicopters dropped a number of barrel bombs on opposition-held parts of the city, according to local civil defense sources. "Three civilians were killed and another 20 were injured in Sunday's attacks," the sources, who insisted on anonymity due to security concerns, said. Barrel bombs are improvised explosive devices packed with shrapnel and explosive material. Usually dropped from army helicopters, the low-cost munitions are believed to have killed thousands of people since the Syria conflict began more than five years ago. Syria has been locked in a vicious civil war since early 2011, when the Assad regime cracked down on pro-democracy protests -- which erupted as part of that year's "Arab Spring" uprisings -- with unexpected ferocity and disproportionate force. Since then, more than a quarter of a million people have been killed and more than 10 million displaced across the war-battered country, according to the UN. Foreign ministers of the countries are scheduled to meet to announce the truce that could start before the Eid al-Adha. "The cease-fire will hopefully begin before the Eid al-Adha festival starting next Monday. As soon as the fighting stops, the Turkish Red Crescent will start delivering food, medicine, clothes and toys for children. Putin said the cease-fire could be secured within days." 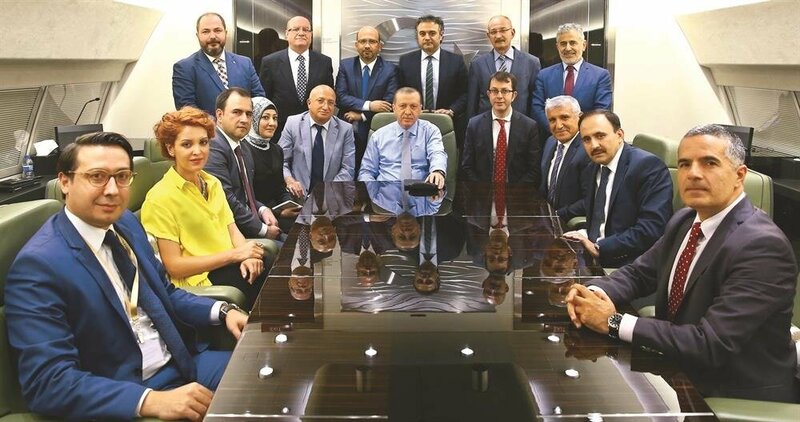 Erdoğan touched upon the extradition of Fetullah Gülen, the U.S.-based leader of the Fetullah Terrorist Organization (FETÖ), who was the mastermind of the July 15 coup attempt, saying that Turkish-U.S. relations mainly depend on Washington's approach on FETÖ and PYD. The extradition of Fetullah Gülen will be one of the hot topics during a visit to Washington by a Turkish parliamentary delegation, a Justice and Development (AK) Party deputy said Tuesday.“July 15 coup attempt and its aftermath, as well as extradition of Gülen and the developments in Syria would be the main topics that we would be talking about,” the party's Istanbul Deputy Ravza Kavakci Kan told Anadolu Agency.Kan said the party's Deputy Chairman for Foreign Relations Mehdi Eker is leading the delegation during the four-day visit this week.The group will meet members of Congress, civil society and opinion leaders as well as media representatives.The parliamentarians will discuss with American officials the legal process of extradition of Gülen for his role in establishing a quasi-state within the Turkish state and ultimately leading the bloody overthrow attempt.Turkey submitted evidence of the activities of the Gülen-led Fetullah Terrorist Organization (FETO) and a formal request for his extradition last month, she said.“We will talk about what we can do beyond that,” she said, noting the group would tell Americans that Gülen and his secretive organization is not only a threat to Turkey but also the U.S.The head of the Turkish-American Inter-Parliamentary Friendship Group, Ali Sarikaya, said the group will also ask American officials to stand with Turkey against FETO, Daesh and PKK/PYD terrorism. "What we expect from them is to stand with Turkey for its very right cause, to stand with Turkish democracy, to hand over the leader of this terror group -- which attempted to harm Turkish democracy and nation -- to the Turkish justice,” Sarikaya said.He said he asked American congressmen for their support for Turkey's demand for Gülen's extradition in a letter to lawmakers after the overthrow attempt.“I hope and wish that American strategic mind would not prefer a terrorist organization to Turkey,” he added.The lawmaker also said the delegation would call on American leaders to consider Turkey's concerns with respect to PYD/PKK elements in northern Syria regarding their separatist motivations inside the war-torn country and being a threat to Turkish national security.The U.S. has been providing support to the YPG, the military wing of PYD/PKK, in its fight against Daesh but Ankara has long objected to that Washington policy, citing the group's terrorist ties to PKK elements in Turkey.“We will re-emphasis that PYD and YPG are no different from PKK,” he said. “We will tell them about our efforts for a unified and democratic Syria.”He added that Turkey and the U.S. need each other more than ever amid turmoil in the Middle East, noting his support for a Turkish-American strategic partnership. "Our citizens are asking how a friendly country such as the U.S. can shelter him. That's what I told Obama and said that they needed to expedite Gülen's extradition or at least incarcerate him so that the Turkish people can turn around and say that something is being done." He indicated the issue would be discussed in detail during his visit to the U.S. to join the UN General Assembly meeting next month. Turkish and American officials are cooperating on Fetullah Guüen's extradition from the U.S., Turkish Deputy Prime Minister Numan Kurtulmuş said Tuesday. "We have good improvements. We have a bilateral commission between Turkey and the U.S. judiciary officials. They are working on the files," Kurtulmuş said during a live interview on CNN's New Day program in New York. The deputy prime minister noted Turkey had clear evidence of Gülen's strong links to the July 15 coup attempt. Asked if Turkey believes the U.S. was involved in the overthrow attempt, Kurtulmus was dismissive. "No, no. It is Fetullah Gülen," has said as he explained what Ankara wants from Washington. "Our expectation from the U.S. government is either to extradite or detain him. We have sent so many evidences to the U.S. officials, so it is now in the hands of the U.S. judiciary system," he said. The satiation in Syrian was also discussed, as Kurtulmuş stressed that Turkey continues to handle millions of refugees from the war-torn country. Turkey has so far accepted more than 3 million refugees from Syria since March 2011, which he said was equivalent to the total number of refugees the U.S. has accepted during the last 50 years. "So, it is really a huge burden of Turkey," he said. “We already spent more than $15 billion on the refugees … without having a solution for Syrian peace, we cannot stop Syrian refugees from coming to Turkey and coming to European continent."